The Chicago locations connected to John Dillinger and other famous bank robbers of the 1930s. During 1933 and 1934, the American heartland was gripped by a wave of bank robberies, as vividly chronicled in Bryan Burrough’s Public Enemies: America’s Greatest Crime Wave and the Birth of the FBI, 1933–34 (Penguin, $16), which is the basis for the new film Public Enemies. Most of the major perps (Machine Gun Kelly, Baby Face Nelson, the Barker gang and, of course, John Dillinger) spent some time in Chicago. Dillinger in particular was in and out of the city between stints in prison and numerous bank robberies in the Midwest. According to Burrough, here’s where the local action was. 1. 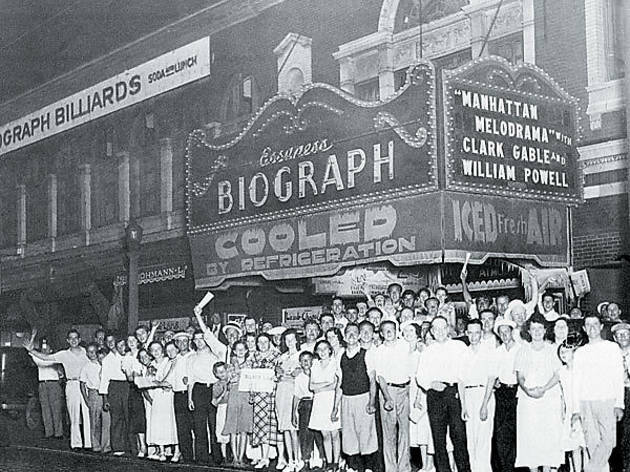 Biograph Theater33 North Lincoln Avenue On July 22, 1934, Dillinger, his girlfriend Polly Hamilton and their roommate Anna Sage, a sometime madam in the midst of being deported to her native Romania, went to the Biograph to see gangster movie Manhattan Melodrama. Dillinger didn’t know Sage had sold him out to FBI agent Melvin Purvis in exchange for having her deportation order lifted. Feds waited for Dillinger outside the theater. To help identify herself and Dillinger to the authorities, Sage wore a bright orange dress (not red, as legend claims—the colored lights outside the theater made it look red). 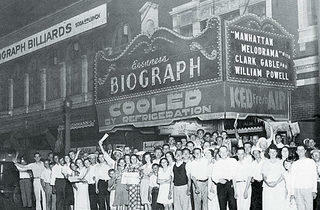 As the trio exited the theater, Dillinger spotted the agents and reached for his .38. He was shot three times and killed on the sidewalk about 20 feet south of the Biograph. 2. Near West Side | north of Maxwell Street Market In the 1910s and 1920s, Joseph and Mary Gillis raised their son Lester (born in 1908) in this area. Lester was in trouble with the law beginning at age 12. In the 1930s, he chose the alias George Nelson, and the media nicknamed him “Baby Face” Nelson for his round, boyish face. Though he robbed banks all over the Midwest, he would die in 1934 in Wilmette, just 20 miles from his boyhood home. 3. Bankers Building | Adams and Clark Streets During the 1933–34 crime wave, the FBI (then known as the Justice Department’s Bureau of Investigation) had offices on the 19th floor. From these offices, Purvis led the hunt for Dillinger. 4. Irving Park Road and Keeler Avenue Suffering from a scalp irritation, Dillinger went to see Dr. Charles Eye at this address on November 15, 1933. The Feds got word and waited for him on the street. Dillinger guessed what was up when he noticed several cars parked facing the wrong way with men inside. He walked calmly to his car, backed rapidly into traffic and led the cops on a chase east on Irving Park Road. Gunfire was exchanged in the middle of the evening traffic. Dillinger veered south onto Elston Avenue, then took a quick right off Elston. The pursuing agents missed the turn, and by the time they turned around, Dillinger had escaped. 5. 2509 North Crawford (now Pulaski Road) In spring 1934, Dillinger was hiding out at a house owned by a shady character named Jimmy Probasco. Worried his fame would lead to capture, Dillinger underwent plastic surgery. On May 28, 1934, hack surgeon Wilhelm Loeser (a.k.a. Ralph Robiend), who did a lot of work for gangsters (including removing their fingerprints with acid or a scalpel), came to the house and altered Dillinger’s face, removing the distinctive cleft from his chin and some facial moles and giving the outlaw a classic face-lift. 6. 2420 North Halsted Street (now Corus Bank) From July 4, 1934, until his death, Dillinger lived at this address with girlfriend Hamilton and Sage. 7. College Inn, Hotel Sherman (now the Thompson Center) | Clark and Randolph Streets Not one for hiding out from the law, Dillinger was a regular on Chicago’s nightlife scene, going unrecognized (or at least not getting ratted out) at numerous hot spots. The College Inn, renowned for its jazz, was one of his favorites. 8. Michigan Tavern | 1150 South Michigan Avenue In September 1933, the FBI intercepted a letter from Machine Gun Kelly’s wife, which revealed he was using this Near South Side bar as a mail drop. The Washington, D.C., office passed this info to Purvis in Chicago. He sent agents to interview the postal carrier, but only late in the evening did it occur to Purvis to send men to the bar. They’d missed Kelly by mere hours. 9. The Federal Reserve Building | Jackson Boulevard and LaSalle Street On September 22, 1933, Alvin Karpis and the Barker brothers robbed Federal Reserve couriers taking sacks out of the building on a hand truck. They escaped by driving west on Jackson, north on Franklin Street and west across the river on Adams Street. Turning right on Halsted Street, they crashed into a car. A policeman on the scene was shot and killed. The gang commandeered a passing car and drove west to Ashland Avenue, where they realized it was low on gas. They stole another car and drove to a hideout on the Southwest Side, where they finally opened the sacks—and discovered they’d gotten away with mail, not money. 10. First National Bank and Trust Company | 720 Chicago Avenue, East Chicago, Indiana On January 15, 1934, Dillinger was robbing the First National Bank when one of the customers placed some money on the counter. Dillinger asked if the cash belonged to the customer or the bank. When the man indicated it was his, Dillinger replied, “You go ahead and take your money. We don’t want your money, just the bank’s.” This helped cement Dillinger’s reputation as a modern-day Robin Hood and made him even more of a media darling.